JAKARTA – Former U.S. ambassador to the United Nations and New Mexico governor Bill Richardson has a record of freeing detainees held by some of the world’s harshest dictatorships. But in working for the release of detained Reuters journalists in Myanmar, he hit a brick wall. “I had success in freeing prisoners in Sudan, Cuba, North Korea, Mexico,” said Richardson, a former cabinet member under U.S. President Bill Clinton, in a telephone interview from his office in the New Mexico capital of Santa Fe. But Richardson could report no such triumph after interceding last week with Myanmar’s de factor leader, Aung San Suu Kyi — herself a former political prisoner — over the two journalists, who face over a decade in jail for alleged breaches of the country’s state secrets law. According to Richardson’s account of their Jan. 22 meeting, Suu Kyi, who won the 1991 Nobel Peace Prize and who now holds the official title of state counsellor, bristled when he raised the detention of journalists Wa Lone and Kyaw Soe Oo, arrested in mid-December. He suggested her reaction was stronger than those of some of the most notorious leaders of other authoritarian regimes he has dealt with. While not all of Richardson’s past interventions have been successful, in the mid-1990s he negotiated the release of an American held in North Korea on spying charges. A decade later, he persuaded Sudan President Omar al-Bashir — who was accused of crimes against humanity in Darfur — to free an American journalist jailed in the country. More recently Richardson sought the release of Kenneth Bae, a Korean-American jailed by North Korea from 2012 to 2014, and Otto Warmbier, released by North Korea in mid-2017, only to succumb six days later to injuries apparently sustained in detention. The failure of Richardson’s latest intervention in Myanmar led to his resignation from an advisory board aimed at addressing the refugee crisis in northern Rakhine State. Richardson described the body as a “whitewash” aimed at justifying the government’s actions in Rakhine. 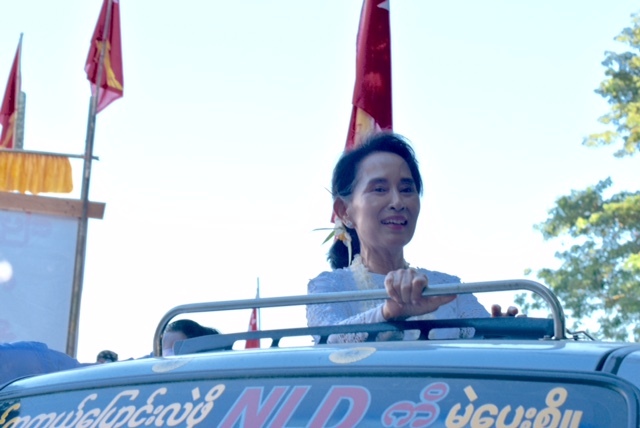 “Aung San Suu Kyi’s reaction to me indicated her unwillingness to hear any advice she did not like,” he said. Almost 700,000 Rohingya refugees fled to neighboring Bangladesh as the Myanmar army carried out brutal reprisals in northern Rakhine in response to Rohingya militant attacks on border posts in late August. Defending the journalists’ arrests, Suu Kyi cited the the Official Secrets Act, a draconian, colonial-era law, according to Richardson. Suu Kyi herself was kept under house arrest for a decade and a half to 2010. Many of her colleagues the National League for Democracy party were similarly jailed under arcane laws. Myanmar said the journalists’ case was outside the advisory board’s purview — an interpretation Richardson disputed. He said a previous commission on Rakhine State, led by former U.N. Secretary General Kofi Annan, set a valid precedent for the body that Richardson resigned from. Annan’s recommendations “clearly state that free access by journalists is important to observe what is happening in Rakhine,” Richardson said, defending his lobbying on behalf of the jailed reporters. Suu Kyi’s office put out a statement late Thursday while Richardson was flying back to the U.S. after announcing his resignation from the advisory board. The government said Richardson had “his own agenda,” and claimed the government had asked him to step down from the commission. Richardson rejected that version of events, adamant that he had already resigned, and that no one from the government asked him to step down. “I had no notification,” he said. The spectacular public affray appears to mark the end of a three-decade political friendship, during which Richardson said he lobbied for Suu Kyi’s release from house arrest. “I still admire and like her, but I am sure that’s not the case on her part,” he said.